01993I PETCOCK 1/4" was replaced with a new part, which has a larger outlet for better air release in emergencies. 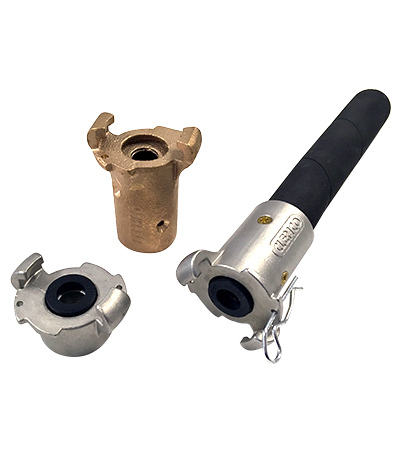 90258D CQB-0 BRASS COUPLING FOR 13 X 7 and 90257D CFB-0 BRASS COUPLING 1/2" are now made of stainless steel to improve the connectivity. The implementation of the new parts will be done step by step, so you might still get the former parts at the moment. The prices have not been changed. 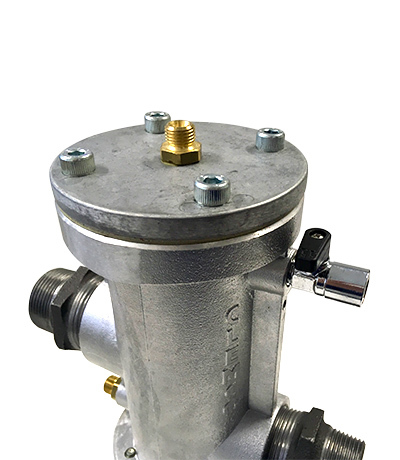 Furthermore we once more would like to guide your attention on our Revision set (price list page 78) for the standard System 7 and all 1 ¼” piped blast pots, which include all the parts that should be maintained regularly to guarantee a well working product with maximum performance. Get to know our interactive product brochure. You get the perfect overview of our complete product range with links for further information. There is nothing more to say than: Curtains up and action! As a result of the shift towards sustainable energy and the associated dismantling of nuclear power plants, we are facing new challenges in terms of both human resources and materials. 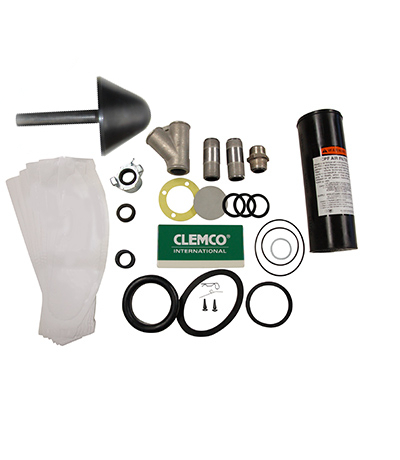 With its decontamination blasting technology, Clemco is rising to the challenge and helping to bring about an energy revolution. Dry blasting contaminated steel and concrete parts is an effective way of achieving this objective while also ensuring maximum safety for users. 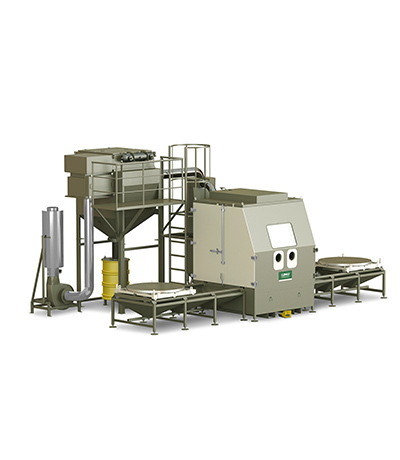 We are already playing an active role in the field of decontamination blasting as a manufacturer. For further information please klick link below. 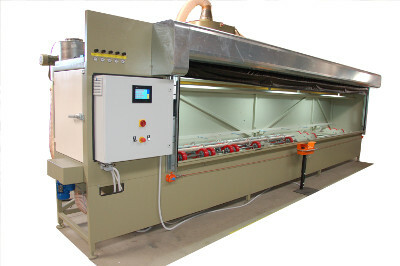 Visit our new special cabinet overview and find the suitable blast cabinet for your project. All the shown cabinets were built in the past and are designed by our engineers for the most economic solution. 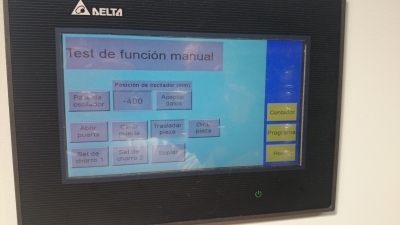 Of course we are able to do further customization, so please don´t hesitate to contact us if you find something suitable. 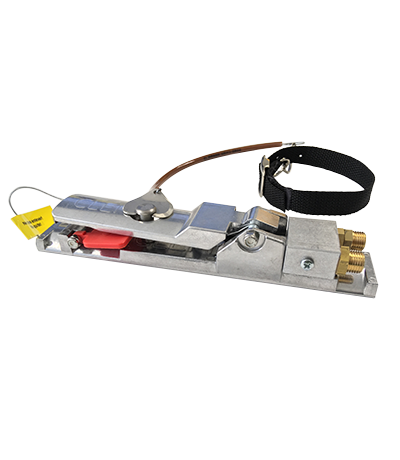 The RLX-III is a pneumatic dead man handle for the remote control of the blast pot. 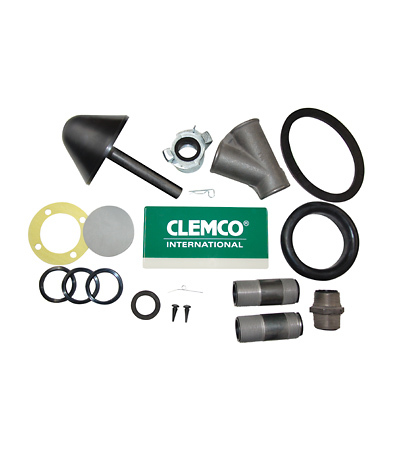 The safety aspect starts with this component in abrasive blasting and therefore CLEMCO gives a special attention on this part. It is not just our name on the product that brings you an extra plus in quality, it is also the manufacturing of high quality raw materials which ensure the highest safety for the operator. 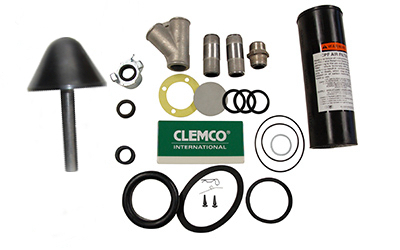 However, CLEMCO also considers the aspect of usability and so we invented the RLX-III with interlock. 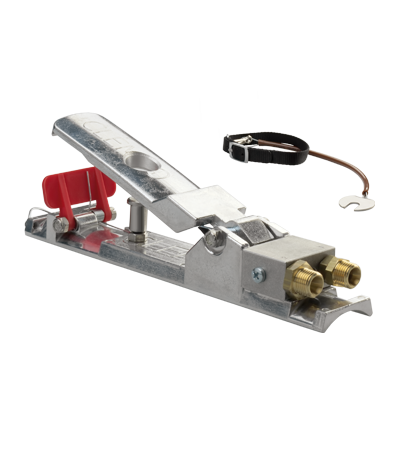 With the interlock you can fix the handle while you are blasting, so that the operator doesn´t need to press the dead man handle during the blast process. This saves time and energy as the operator doesn´t need to take care of pressing the dead man handle permanently during blasting. The design of the RLX-III with interlock also considers the safety aspect which is the actual benefit of a deadman handle. In any case of accident, when the operator drops the dead man handle, the interlock will disconnect and stop the blast process, just like the standard RLX-III. 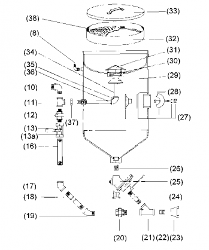 This is an additional feature which makes the blast process more comfortable and because of that also more efficient. 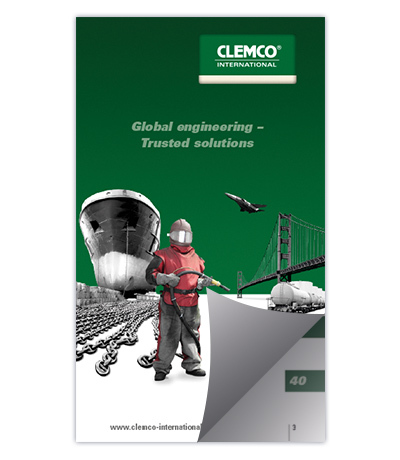 Also have a look on http://www.clemco-international.com/en/rlx-iii-dear-man-handle-interlock for further information. Try our RLX-III dead man handle with interlock and ask for item number 24366D (or 24388D for the electric version RLX-E). Inner pipe blasting operations are getting more and more, especially for maintenance and repair work for oil, gas and water pipelines. 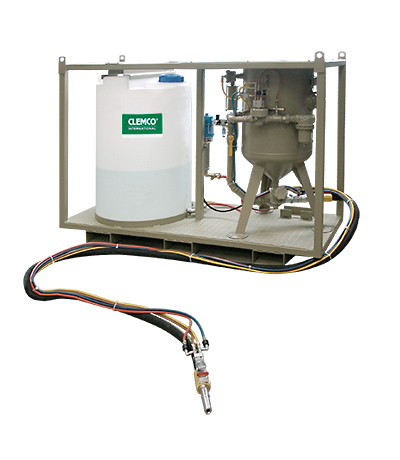 The Clemco product range for inner pipe blast units is designed for pipes between 19 – 1500mm (3/4 – 60”) and the largest unit is the SPIN XL which is covering the largest diameter range with 400 – 1500mm. Continuous improving of our products is one of our main intentions and so did our engineers with the SPIN XL. The general function and efficiency still is the same, but the pressure motor for the nozzle rotation was improved. Compared to the blast head of the Spin Blast unit, which is rotating due to the return beam of the nozzle, the SPIN XL has an own pressure motor for consistent rotation of the nozzles even at and especially for large pipe diameters. The new motor is an oil free motor, which doesn´t need an oiler etc. that must be added to the air supply. At the time when no oil is needed, the advantage is that no oil can get into the pipe which impurifies it and also the blast media. The required air for the SPIN XL is now 10m³/min for 8mm nozzle and 15m³/min for 9,5mm nozzle. 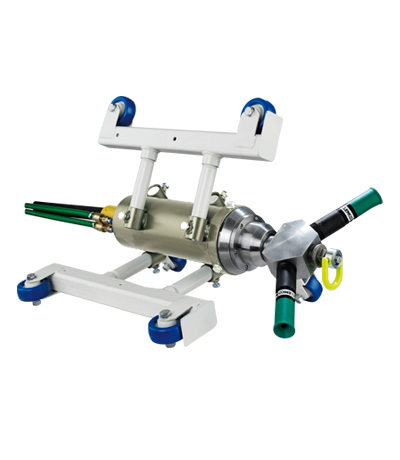 With the steel frame, the integrated water pump and 500l water tank, the Wetblast Flex is not bound to a fixed position and continuous water supply. It can be used anywhere and just needs an adequate pressurized air supply. Another advantage of the Wetblast Flex set up is that the water will be added to the blast stream after the blast pot and metering valve, so that you do not need to clean the blast pot regularly after using. This is also a very economical handling for the blast pot. The SC-2048 (140l) pressure blast pot and the CTSD-X-6 (9,5mm) nozzle gives you the performance you need for your specific blast job, whether for dry blasting or wet blasting. 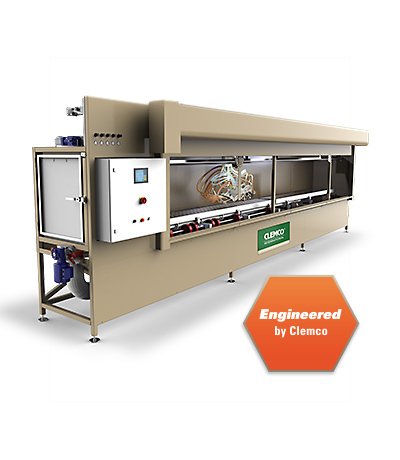 The Clemco Scaffolding Blast Cabinet is an engineered automatic cabinet. It is an excellent solution to clean impure scaffolding parts. Adjustable for poles and platforms, the cabinet is very flexible and perfect to maintain your equipment. 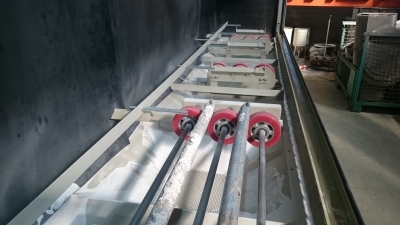 Eight injector nozzles and flexible parametric blast programs are cleaning the scaffolding parts automatically. Our engineers integrated a roller shutter door, which is not only space saving, but also time saving. 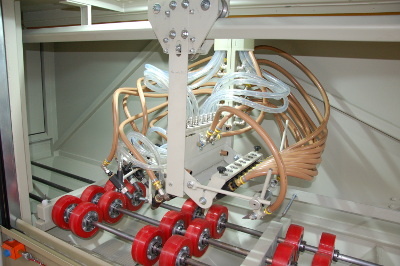 Thanks to our engineering capacities, the machine concept can be modified for similar parts. 2017 has started and we would like to introduce our news area, where you can read interesting news from and about us and the abrasive blasting. We want to inform you about realised projects, new and updated products and general news. So visit our homepage and you are always up to date! The current weather conditions are just perfect to introduce a new product in our portfolio, the Revision Set. There are two different Revision Sets, one for our standard 1 ¼” blast pots (27237D) and one for our System 7 (with FSV or QK metering valve) (27236D). The winter time is used by many operators to check their equipment and replace old gaskets etc. on the equipment and the Revision Set offers the needed parts for that. It helps to keep the blast pot in good condition and helps to extend the lifetime of the blast pot. 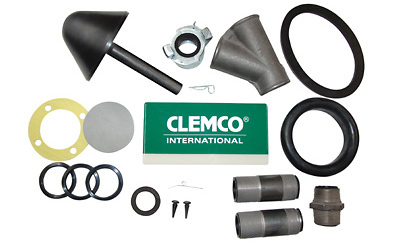 For further information and prices, please contact your local distributor or Clemco directly.